Team UrbanMeisters is built on one simple principle – helping you get on a green lifestyle without going to extremes. We bring you best and most uncomplicated green tips, products, brands so that you can kick-start green living minus mountain-moving efforts in your already time-crunched multi-tasking urban lifestyles. But dear conscious readers, sometimes we can all get overwhelmed by the magnitude of pollution, climate change, the amount of global waste. Our green efforts may feel like they are going into a black-hole. Our zero-waste, plastic-free, capsule wardrobe efforts begin to feel pointless. So how do we not give up on a green lifestyle? How do we not get thrown under the green bus instead of riding it happy & proud? Our special green-motivation feature brings a list of tips collated from sustainable bloggers and influencers to keep those green vibes & determination strong! To help you stay on the conscious track, we have joined forces with fellow greenie and guest writer Jule. She authors the blog The Happy Choices and has gathered a treasury of wisdom from multiple environmentalists, bringing you Go-to Tips on How to Keep a Positive Attitude and Never Give up – including tips from our own founder Mirela Orlovic. 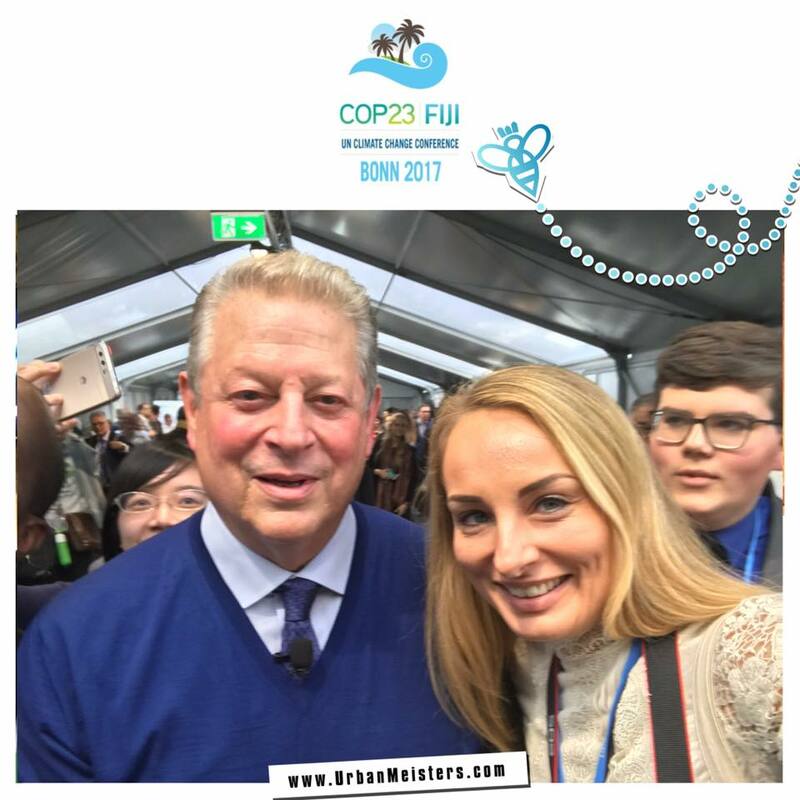 But here she also met a social scientist & her initiative Sustainability4Seychelles that showed her how collaboration can help. We also did a special feature of some of the top UrbanMeisters collaborators & green influencers who inspired us tremendously! 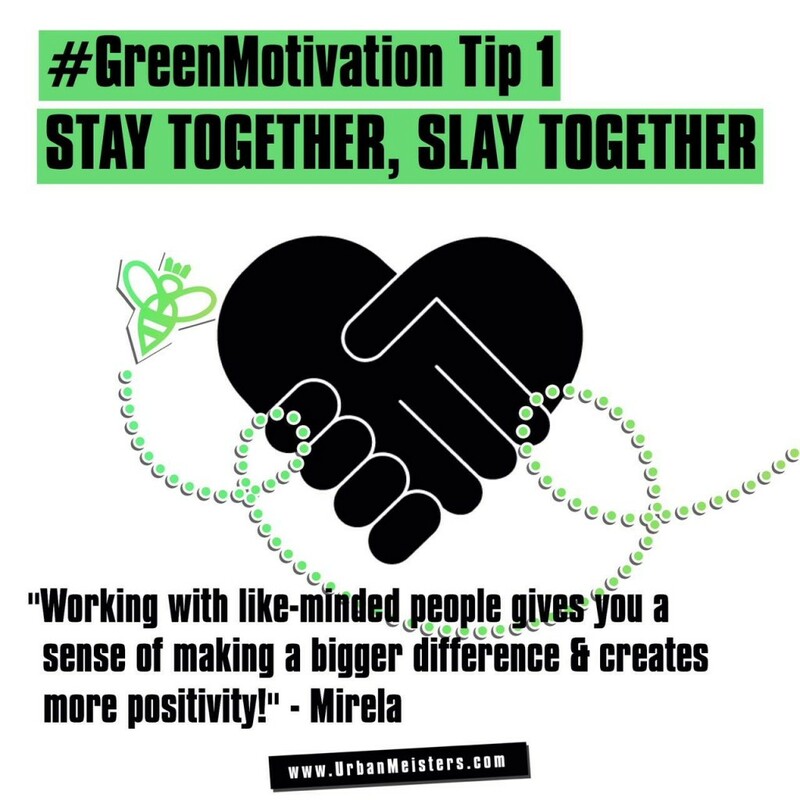 A little time back, with similar idea of collaboration in mind, green blogger Jule reached out to Mirela & multiple other bloggers to work-out a special green motivation feature. How do some of these green influencers stay motivated & committed? Jule, having grown up near the Baltic Sea, has always been an ocean lover. On her travels across the world, it broke her heart to see scenic water bodies covered with plastic trash and she knew straight away that something had to be done. 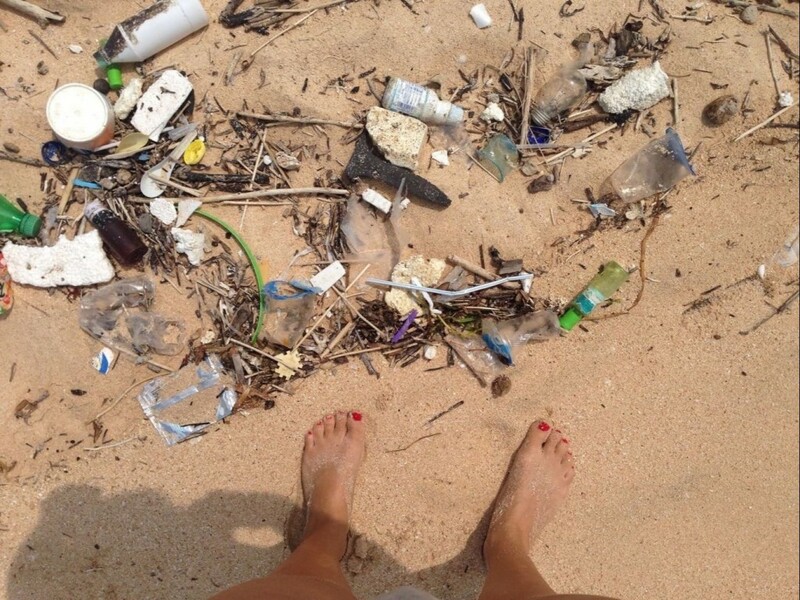 She uses her experiences to inspire people to – in her own words – leave only footprints (and no plastic footprints). 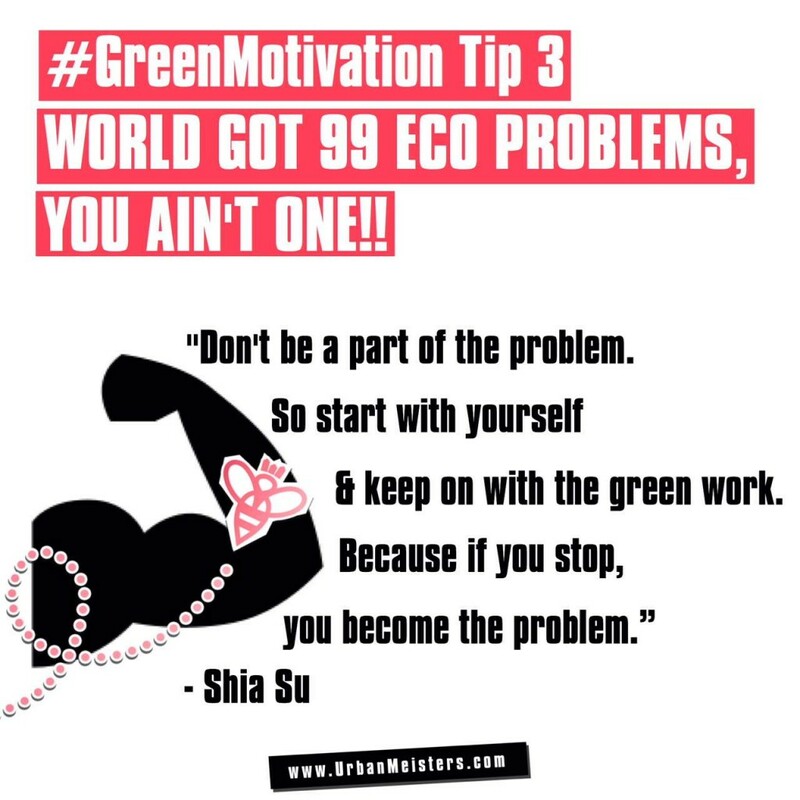 And in her green-motivation feature, she lists tips to help you stay upbeat & eco-friendly. 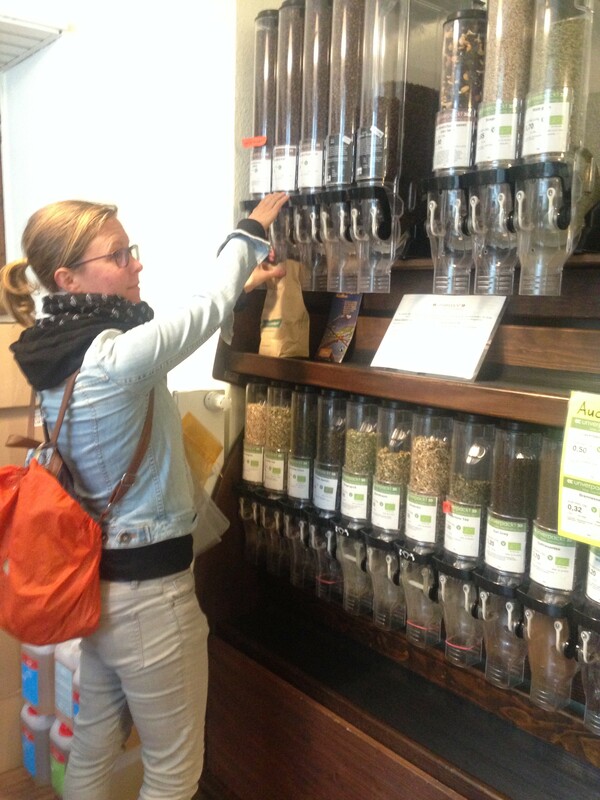 What is UrbanMeisters founder Mirela’s green-fuel? “Everyone can end up feeling like their work is a drop in the ocean. I am convinced that one needs to be a part of a community to keep on plowing through and feel empowered. 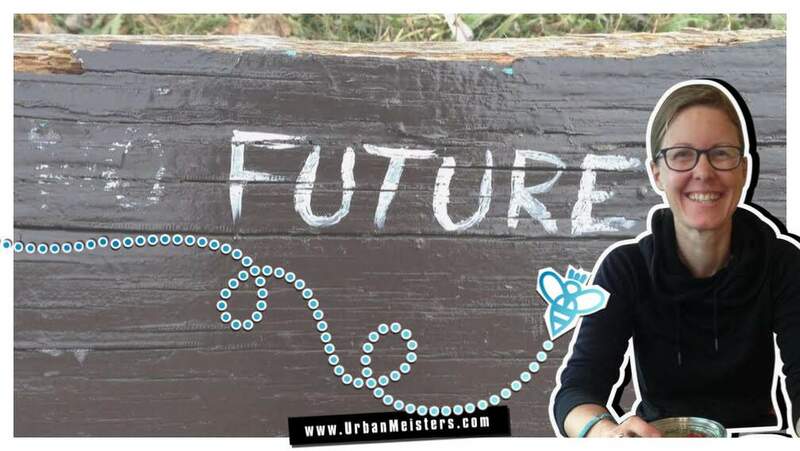 That’s one of the reasons why I started UrbanMeisters – the first sustainable lifestyle community aimed at making urban green living easy & fun through collaboration. 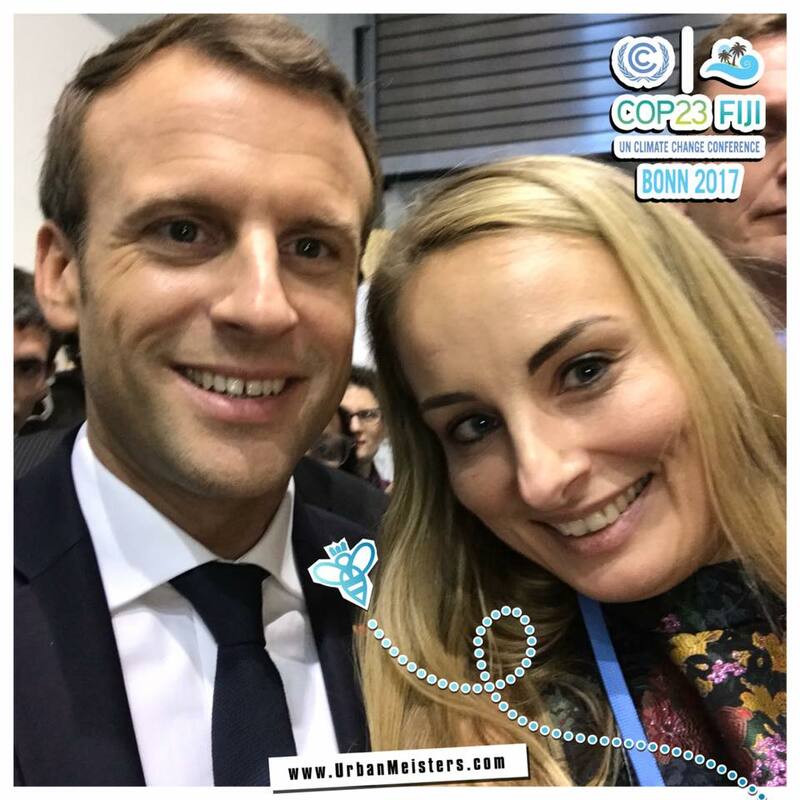 One of the things I find particularly inspiring is the work and energy and upbeat vibe of youngsters when it comes to going green – they are a source of tremendous inspiration and power.” Read Mirela’s complete tip on The Happy Choices. Keep Calm & keep on greening! 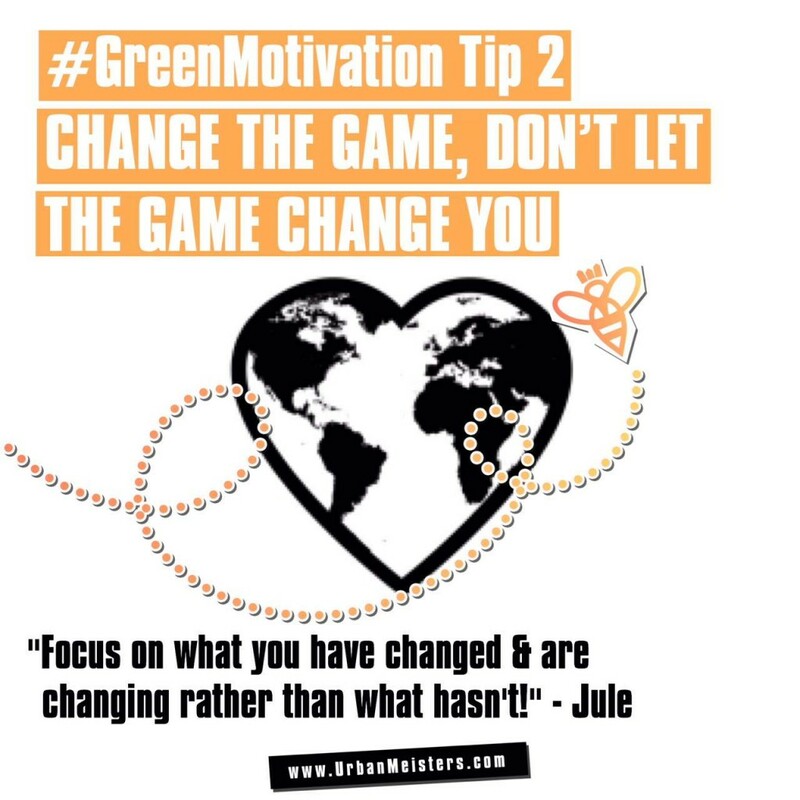 Here’s a preview from Jule’s feature on how to keep your green outlook positive…”Keeping a positive attitude can be challenging when you are facing a global problem like environmental issues, plastic pollution, poverty, climate change etc. It’s hard not to fall into a circle of negative thoughts some times. But if you want to fight against these issues it’s even more important to stay positive and encouraged.I’ve been a rather pessimistic person for a long time in my life and just started to work on being more optimistic for a few months when I first got pushed head forward into the plastic pollution problem. I couldn’t stop seeing it everywhere. I’ve been devastated by seeing all the litter everywhere. I complained and got annoyed about people who weren’t aware about plastic (I forgot quickly that I haven’t been aware like I do now before too) and I didn’t know where to put those feelings until I realized (when I was sitting on a beach in Malaysia surrounded by plastic bottles). I feel better when I do something rather than just complain, so I started to do clean-ups regularly. 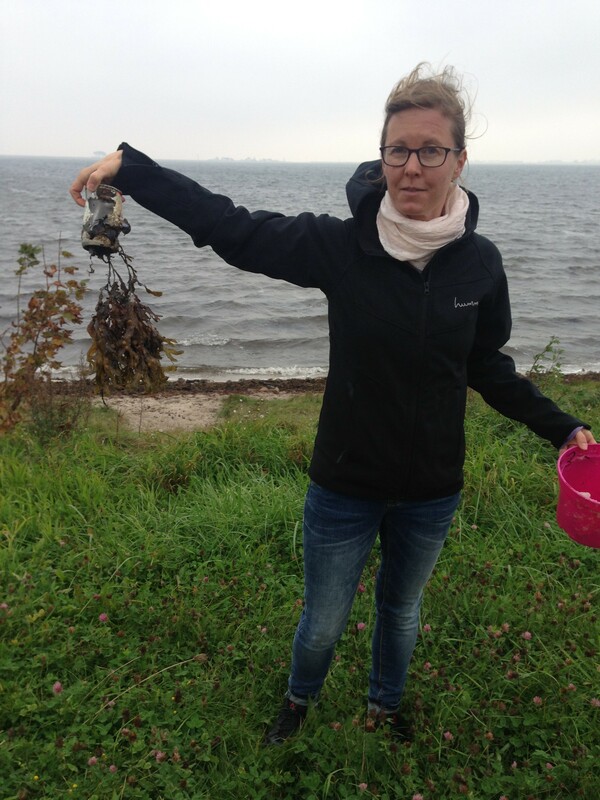 I started to connect with likeminded people and I started to do research for solutions and alternatives to plastic.” Read complete story on how Jule got on her green marks & jet-setted off! Take control over what you can, and stop worrying about what you can’t control. -You can control what you are buying, you can’t control what others buy. Read and listen to positive green informations/news – Big Companies are getting aware and on board. Like Dell recently partnered with Lonely Whale to address the problem of marine litter. People all over the world are inventing edible cutlery and more great products like a drinkable/edible plastic bags. Be with positive people as often as possible – Surround yourself with positive and happy people, make your feed on IG or FB positive. Build your own support team – This can be online or in social life. Find people to meet up with, get your family or friends on board, find an organization in your city you can join. Fight for the good every day – Try to find the good in every person and in every situation. 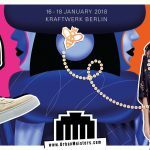 Read here for more empowering tips from Jule, Mirela and other wonderful green bloggers & influencers like Shia Su of The Wasteland Rebel Project, Delphine Robbe of Gilli Eco Trust and many more! When like-minded greenies join hands, it is hard not to follow in their footsteps and stay green for our family & loved planet with equal vigour. So keep up that green attitude, tighten your carbon free arsenal and march ahead! Feeling all green-recharged? Wanting to make a difference? Well be it food, fashion, work, travel, fitness or daily commute, get Mirela’s exclusive green living guide for easy zero time taking tips to make some green switches.